Upper Thomas Creek is a fun, very scenic run that isn't often done for several reasons. First, most of the upper access points are blocked by gates most of the year. The gates are only open during hunting season, so you pretty much have to get on this run in the Fall. Second, the roads are sometimes difficult to figure out, and even paddlers who do know the way often find the road blocked by a tree or washout. 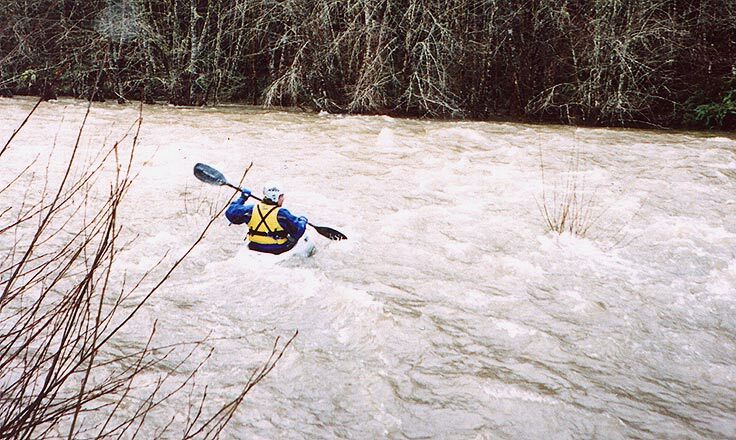 In December 2001 we ran Upper Thomas Creek at very high flows, and the trip quickly turned into an adventure worth telling. We had run nearby Sardine Creek the day before and there had been eight inches of snow on the ground when we took out. The next day, driving up to Thomas, the hills were green and it was raining again. I remember thinking that Thomas was likely to be at or near floodstage considering the significant snowmelt event that had occurred, and my intuition was pretty much right on target. (We later checked and Pat Welches gauge peaked at 8300 cfs when we were on the creek.) For this trip I was joined by my old paddling buddy John Horn, (who had run the creek the day before at a fraction of the current flow) Shell Jeppesen of Portland, and Troy Longstroth from Bend. I remember that every side creek we drove across on the way to the put-in was runnable in it's own right, which meant that Thomas was sure to be all cranked-up and looking for trouble. We drove up and looked at 40-foot Thomas Creek falls just upstream of the put-in and there was about 2000 cfs going over it, which was pretty spectacular. 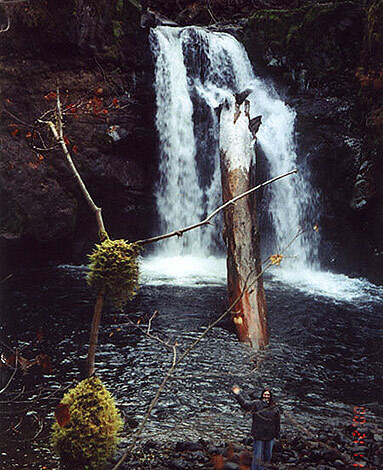 I had seen a photo of Susan below the falls at low flows, and the log in that picture was totally covered with water! The boils were ten feet high and the water was full of debris. 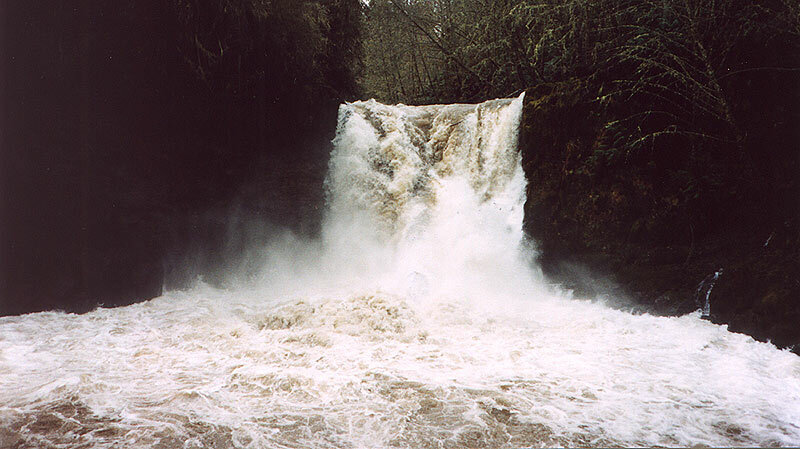 Susan Horn, below Thomas Creek Falls in the Fall of 2000. That log is still in there. 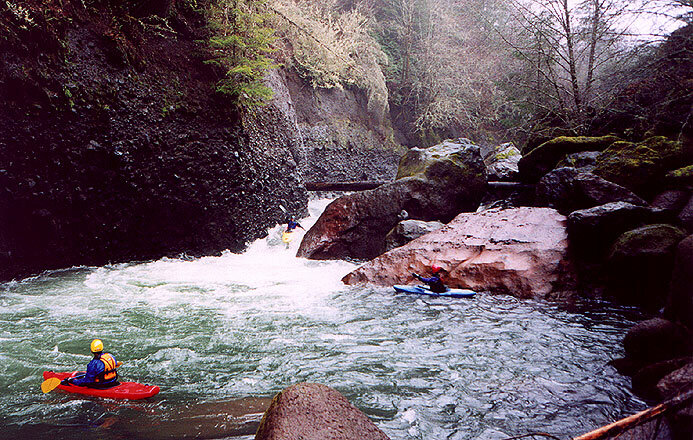 Paddling creeks at super high flows is always fun, especially a run like Thomas, which is class III at lower flows but was more like IV+ on this day. 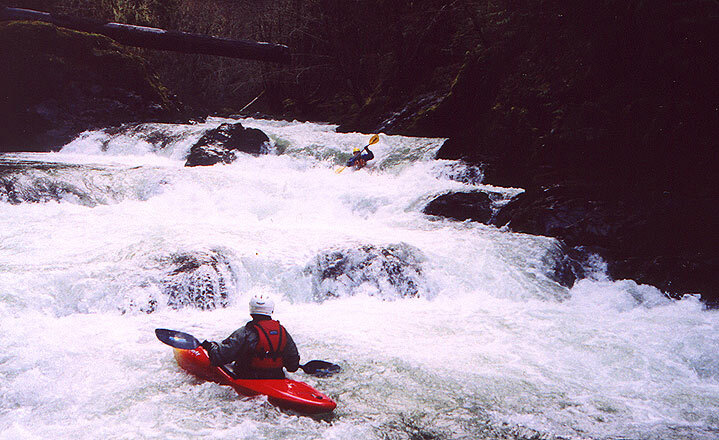 Of course, high-water creeking is a whole different kind of boating, and paranoia is often the best policy. When a creek is in the trees (as Thomas was that day) swimming becomes extremely dangerous. You are virtually guaranteed to lose gear, and the eddy lines can trash a swimmer (or a paddler!) almost as bad as any of the holes. Of course, getting to shore when the creek is ripping though the trees is often as dangerous as staying with the flow, so swims are always life-threatening. It kind of puts an edge on things, if you know what I mean. I guess the bottom line is: You should never, ever, ever swim a creek at high flows. Of course, high water runs are usually when the best laid plans are laid to waste, and today was no exception. We got to the put-in and the creek was in the trees. We estimated that there was about 2000 cfs in the creek, give or take a few hundred. It looked really good, so we made our way down to the water. Of course, once we got down to creek level it looked more like Thomas River than Thomas Creek. Troy ferries out to catch a wave at the put-in. None of us but John had ever done the run before, so he warned us about a drop a quarter mile downstream. "I have no idea what that thing is going to look like." He said. "It may not be runnable because of a log, so we'll want to scout it." We peeled out into the current and surged downstream. In a very short time we crashed into a brush-filled eddy just above the first drop. Sure enough, there was a log in it, but the wood was pretty much covered. What was more of a concern was the killer hydraulic on the right, which was recirculating from fifteen feet downstream. My good friend Pete almost drowned in this hole six years ago (at lower flows than this!) and none of us wanted to challenge it. The left side looked doable, but the water was surging over the log, making that side marginal. If you didn't make it over the log, you might end up going right whether you wanted to or not. The following week we came back at a much lower flow and everyone ran this drop, though not all made it through cleanly. Even with a fraction of the water two boaters got stuck in the right side hole. One was recirculated three times in his boat but fought his way out, and the other swam and then took three trips back up into the hole before being kicked out. This drop looks pretty easy at lower flows, but if your bow gets blown right and you get against the right wall you'd better have a rope ready! 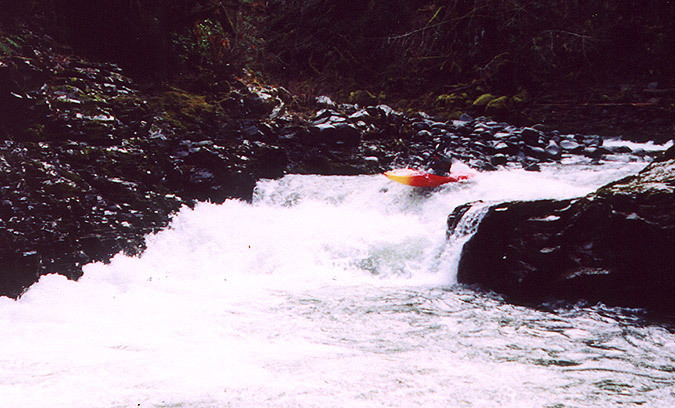 Shell Jeppesen runs the drop pictured above one week later at MUCH lower flows. (This photo was taken from the same spot as the photo above) Notice the log up on the large boulder in the middle of the creek. The log is present in the first photo too, but it is mostly underwater. If you look closely in the photo above you can just see it blocking the river left slot, but most of it was under water. The paddlers in this photo also help give scale to the enormous terminal hydraulic that dominates the river-right side of the high water photo. Below here were more big, fast wave trains and then the creek turned sharply to the right. At this point we were paired up, with John and Troy in the front followed by Shell, with me in the back as sweep. I remember that I was following closely behind Shell when she disappeared into a hole in the middle of the creek and started getting trashed. 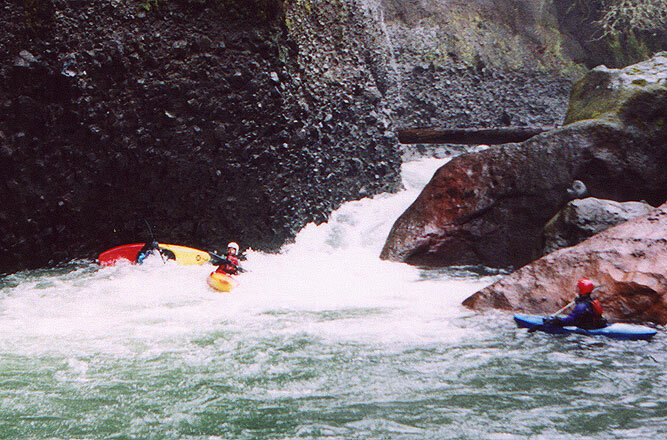 I started back-paddling as I saw her paddle jerking back and forth as she flipped, rolled up, and finally managed to initiate her stern, at which point the hole tossed her downstream. Just below this hole we caught an eddy on the left and took a breather. I craned my neck to see downstream, but I couldn't see a thing. "Hey John!" I yelled over the roar of the creek. "Are there any more ledgy drops that might develop bad holes down there?" John shook his head. "I don't know." He said grimly. "This thing is sooo much higher than yesterday that I don't remember anything. It's all different. Plus, we're moving so fast I'm not even really sure where we are..."
Once again I tried to see downstream but there was nothing but white. There was a sizable creek coming in on the left, adding about 200 more cfs to this already overloaded creek. "Alright, listen up guys." I said. "If something happens and you swim, get the hell out of the water. Forget about your boat, just get out of the water as fast as you can..."
With that I began to ferry across to the other side of the creek to try and determine what was below us. The ferry was surprisingly difficult, and I just made it over to the other side. 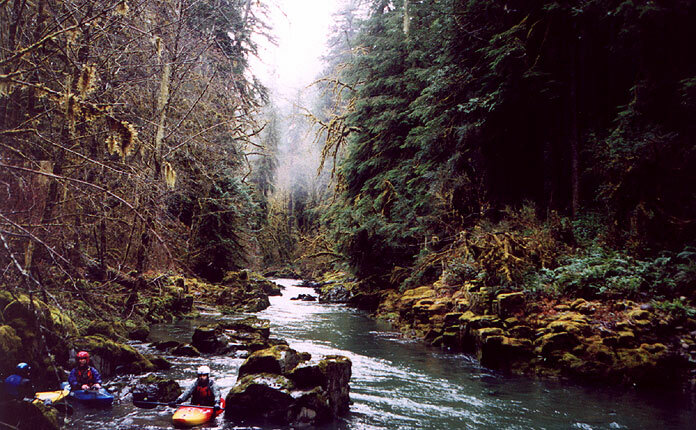 Below was a long rapid, and because I couldn't see all the way downstream I was thinking about scouting from the bank. As I watched, John charged upstream as high as he could and then ferried across, pulling for all he was worth, followed by Troy. For a moment Shell disappeared, and then I saw her boat go vertical, then she was gone. Cursing, I peeled out of the eddy and charged downstream after her. I quickly caught up to her, and then she flipped again and I lost track of her in the huge hydraulics. I was staying generally to her right as I didn't want to run over her, but at the same time I was trying to stay close enough to her in case she came out of her boat. After another fifty feet or so I saw that Shell was out of her boat and suddenly things looked really bad. Finally I was able to catch up to her and yelled for her to grab by stern. Soon we swung into an eddy against the right bank. Shell climbed out and I saw John disappearing around the corner in pursuit of her boat. "You Ok?" I yelled. She nodded. "Start hiking downstream; I'm going after John!" with that I tore downstream while Troy stayed with Shell. I had a helluva time catching John. At one point I saw him duck under a logjam that was spanning the creek like an arch with one log hanging down in middle of the creek. It looked really bad from above, but John went right on through so I figured what the heck and went under it too... Finally I caught up to John in a surging eddy just below an wickedly undercut rock on the river left side. "I was pushing it all the way to there." He said. "But I didn't like the look of that rock so I let it go. I'm pretty sure it went under there..."
We got out and started hiking back upstream. After about ten minutes we hooked up with Shell and Troy, and then we got back down to our boats. None of us really knew how far it was to the road, so we decided the best plan was to have Shell hike out along the creek. That way if she slipped and twisted an ankle we would at least know where she was; if she wandered off into the woods in search of the road and got hurt things could get ugly fast. I left my water filter and a couple of Powerbars with Shell, and then we took off down the creek. John estimated that she had over two miles of hiking through rugged, densely forested terrain, and there wasn't much daylight left. The rest of the run was a blur. Troy got trashed the whole way down in his little boat, but he still managed to fight his way through. He must have rolled thirty times by the time we got to the bottom, leaving him pretty much exhausted by the time we reached the bridge. We got up to the road and soon Susan rolled up. It was getting dark so I wasted no time. I grabbed a flashlight, put on some dry clothes, and hopped in the car with Susan. She drove me about a half mile upstream and then I hit the woodline, looking for Shell. It was very rough terrain at first, and I was not at all optimistic that I would be able to find her by dark. At one point I had to hike back up to the road to get past a creek coming in though a small draw, and then I was down near the water again. Soon I found a ghost of a path winding through the growing darkness and I was able to run for short distances. There were enormous old-growth trees in there, but I was moving way too fast to admire them. After about twenty minutes I heard a whistle ahead and I found Shell. She had covered a little over a mile and was pretty much done in. We headed up to the road and hiked out, and just as we were changing back at the car it started to rain again. In retrospect I'm glad everything turned out well. Even though Shell lost her boat she stuck to the plan and got out of there before dark. In all, it was a useful learning experience for everyone involved. The following week we returned to Upper Thomas to try and find Shell's boat at much lower flows. We didn't find any trace of the boat, but I managed to shoot some nice photos of some of the larger rapids. We were also able to admire the untouched forests that border this creek; this is a very scenic stretch. This is a nice double drop about half way down. Here John Horn gets a nice boof off of the midstream boulder before dropping into the bottom hole. I didn't realize how scenic upper Thomas Creek really is until my second trip down. 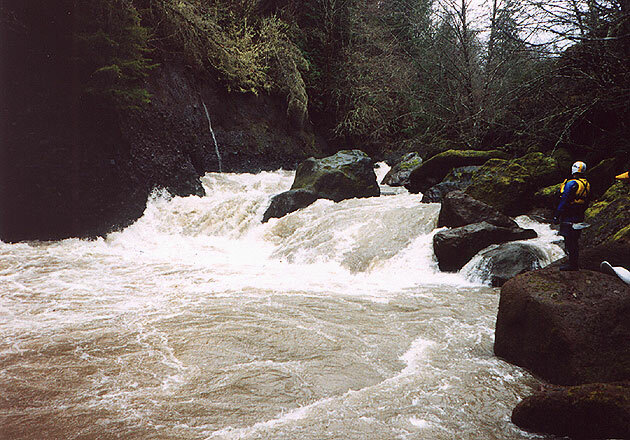 This is a nice view looking upstream at one of the rapids. John Horn looks on as Paul Kuenzi runs The Ledges, which is the last major rapid on Upper Thomas Creek. ACCESS: Upper Thomas is only accessible during hunting season, in the fall. Even with guidebook instructions, it is often difficult to find the put in for this run. Below is an image of a sketchy map I drew that might help someone come in the back way and get to Thomas Creek Falls. This takes an alternate route not described in Soggy Sneakers. The Soggy description brings you up Thomas Creek Road, and though neither route is better than the other, this gives you some idea of what to expect. There are MANY roads turning off the Thomas Creek road route as well, so expect to do a little exploring your first time up there. The key is the two gates, one yellow and one brown. Once you see those gates you are very close to the falls.